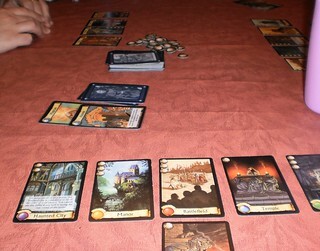 The Ohio friends are a group that has been getting together for eons, usually on a Monday night, to play games. The gaming location varies between houses but it's the same crew. When I came through for the very first time, back in November 2010, I made sure my trip included a stop-over on Monday night so I could participate in game night. Games have always been a part of my life. Growing up, we had the usual; Scrabble, Sorry, Monopoly, Chutes and Ladders, Candy Land, etc. My house contains three dozen games of the card and board variety. When Carole was growing up, we got one or two new games a year. I don't do well with strategy games. I term them "stradegy", because my strategy is usually a tragedy. I have never won Clue. The logic of trying to figure out who did it with what where eludes me. I'll play it but I have never, ever won. April and Perry, Jim and Joe, Chad and Chris, Jim M and Greg are gamers in the purest sense of the word. They follow gamer podcasts and YouTube updates. They keep abreast of what games have been added to the pantheon available at a local store or online. I have nothing they haven't played to death, but there is a vast world of games that I have never experienced. Part of the trip was to assure myself a spot at the table, to be exposed to new games and at least one old one. I know I'll forget something or put what we played in the wrong order, but here goes. Perry and I played Carcassonne. I really like that game. Every time I visit, I want to play it. It's sort of strategy but it is determined by the tiles you draw. Then, he taught me to play Dominion. I wasn't too sure about the game at first, but it grew on me. I don't think we played anything else, just the two of us, after Dominion because it was time to get ready for the party. While we waited for people to arrive, we played a newer card game called The Resistance. In this game, spies infiltrate a group of resistance fighters. You draw a card at the beginning which tells you if you are a loyal member of the resistance or a spy. A leader, which rotates around the players, chooses a certain number of people to go on missions. You get to vote on whether you think these people will carry out the mission. Then, they get to vote on whether the mission succeeds. Loyalists have to vote yes. Spies can vote yes or no. It was great fun to try to figure out who was the spy. 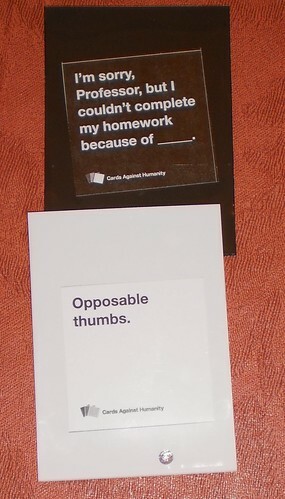 After dinner, we played a game I knew about because Carole plays it; Cards Against Humanity. You can see one set up above. If you are easily offended, do not play this game. If you like Apples to Apples and have a quirky sense of humor, you will love this. It's exactly like Apples to Apples but the cards, well, interesting doesn't quite cover it. There was much, much laughter and poor April got the worst one to read. She wound up handing off the black card to someone else to read because she was laughing so hard. 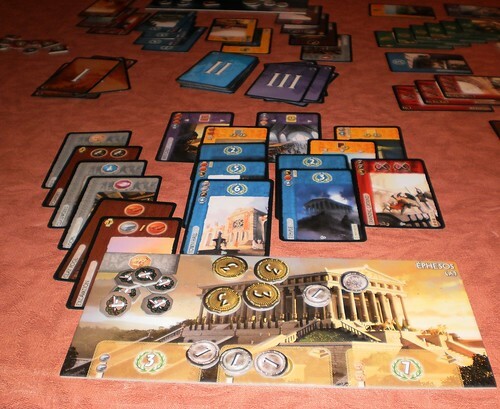 This is a game called 7 Wonders. We ended the night with this but I know we played something else that I had to learn and have forgotten the name of already. It was green. I was lousy at 7 Wonders. I had a lot of cards, but you also have to build wonders from each age and that part I didn't understand. Oh well. We had to maximize gaming and card games seem to be the best way to do that. On Monday, Perry and I played quite a few games in the afternoon. We started with a game by one of my favorite card game creators, GameWright. We played Forbidden Island and There's a Moose in the House. I really liked both of those. After those, we set up Settlers of Catan, but discovered you can't play that with two people. 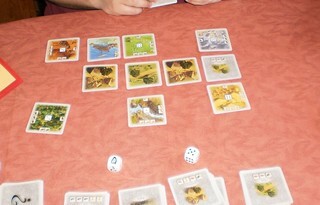 So, Perry pulled out Rivals of Catan, a card game with the same idea. This was great fun. It took me a bit to figure out what I was supposed to do, but it is easily learned. I won that game. I was quite surprised. Chris arrived at this point and we played some Wii bowling. I had never done that. I'm rather impressed that Wii bowling even gets your hook. In spite of tossing the only gutter ball, I won with a 146. We had supper and settled into another Cards Against Humanity. It was fun but the game definitely benefits from having more rather than fewer people. After that, we played Citadel. This was a very fun game, once I got the hang of it. From there, it was another round of Cards Against Humanity and we ended the night with Munchkin Impossible. Last year, I played Munchkin for the first time under the Munchkin Booty banner. 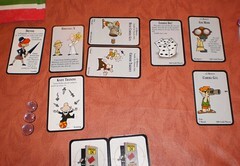 Munchkin Impossible was just as silly and enjoyable. I do miss gaming. I miss the long games of Trivial Pursuit we used to have. I have a large number of GameWright games, including a few they don't make anymore. Nothing like a rousing round of Rat-A-Tat Cat to end an evening. In getting together, it's not just about the games, trying something new or something familiar. It's about the camaraderie. It's about friendship. It's about being with other people, sharing life and conversation and insults across the table. I got to see a lot of different games, games that, if I had a group I regularly played with, I'd get. Most importantly, it's about laughter and togetherness. Solitaire is nice but sometimes, there's nothing better than playing a card on your neighbor that destroys his army.